Sport's television is a multi-billion dollar industry that draws millions upon millions of viewers to a gigantic range of sports programming. Many of the most watched television events have been sports broadcasts, the Olympics, the World Cup, and the Super Bowl to name a few. It's an ever-growing universal industry that generates popularity at all levels. 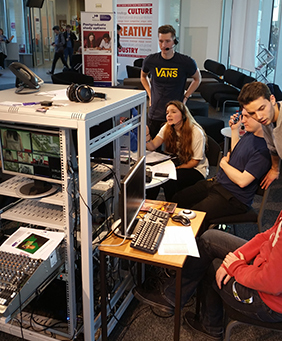 The University of Portsmouth's CCI TV Channel has a strong reputation of creating high quality content whilst maintaining a weekly live television show. However what the channel has never seriously ventured live sport. Other than my raw passion for it, it's the popularity of televised sport that has led me to ensure that the CCI TV Channel will enter the world of live sports programming. For the last four or so months, alongside from my studies, I have been researching, planning and preparing for the challenge of producing a live outside sports broadcast via satellite for the CCI TV Channel. As far as we are aware, this has only been done in a few institutions, and never in Portsmouth. Thus we are venturing into unfamiliar territory and so far the greatest challenge has been learning the ins and outs of the Television & Broadcasting course's latest purchase, a satellite MiniCaster. The kit will allow us to go live from outside of the University for the first time. There have been technical barriers to break such as the actual physical aspect of transporting the satellite dish, which come to think of it was always going to be an issue, but its only when you start the planning that some elements throw themselves up as issues. 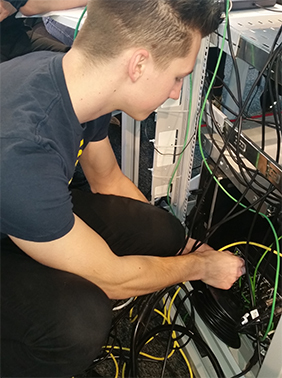 The networking aspects of getting the satellite talking the university network is another very complicated area, and both academic staff and support staff have been working to make this part of the plan happen with various firewall ports being allocated to particular switches and hubs. A question of height is also part of the technical mix, with height being paramount to a successful transmission. When selecting a sports event for the broadcast, it has always been my priority to choose one that enables the channel to produce content that is closest to industry standard as possible. Sports such as football, rugby and motor racing all require sizeable crews with a vast array of cameras, due to the large area required to be covered as well as the large number of competitors. Whereas individual sports can be often be covered with a little more ease. As a result the sport that has become my top choice is tennis. Having worked with Sky Sports in the past on live tennis programming, I am aware of the camera requirements as well as the production process of producing live tennis coverage. 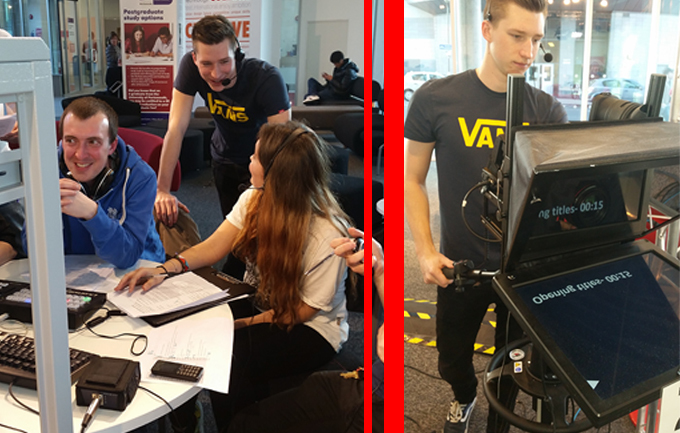 My final year studying Television & Broadcasting at the University of Portsmouth has gone incredibly quickly, buts that not to say it was easy. Its been an enjoyable but demanding 8 months having to produce four live shows, shooting a documentary, as well as working on my final year project, all to strict deadlines. I feel I have learnt a great deal, using new equipment, experimenting with different production roles and leading projects. Having a wide knowledge of all areas of production is something that I have always felt is important. As I approach the end of my studies and my university life, I was expecting to feel like many do; not wanting to leave university to enter the world of work. However I really am looking forward to graduating this year; I can't wait to finally get involved. Much of my spare time has been spent on networking and attempting to gain industry experience, which helped me find my first paid work in television. For the last eight months alongside my studies, I have been working as a freelance logger for IMG Media's European Tour Productions golf team. The work involves travelling to European Golf Tour events with the production team and logging shot times with a camera operator - timings are essential for the producers when compiling a programme. Logging live satellite feeds from golf events is another element of the work. It's a fun and rewarding post that I see as the perfect first step on the ladder in the TV industry. In regards to the future, I hope to remain within sports television, but to enter into the realm of producing. My ultimate ambition is to work within tennis or Formula 1 coverage. It's a long tough road but I am excited with the possible career prospects ahead of me.